Our friends at Victoria Stone Gallery may be new to the area, but are certainly not new to the block. VSG are wholesale stone slab suppliers bringing to Melbourne a selection of some of the most beautiful natural stone. The team come from a background in stone, having been internationally immersed in the industry for fifteen years and counting. Trendstone Quartz Stone Slab Arrives in Victoria. Our favourite quartz brand, Trendstone, is also being stock at VSG. Customers focus on the inclusion of the recently unveiled marble-look range, which includes Calacatta inspired colours. 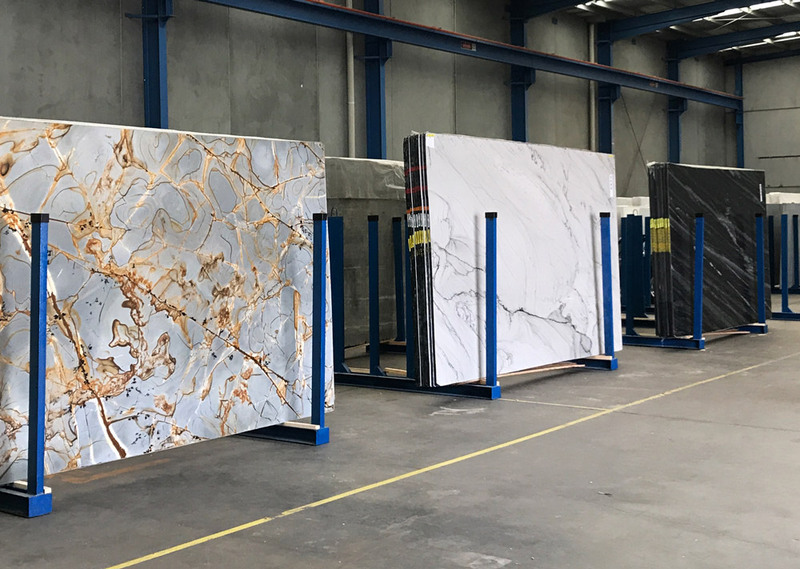 The Australian stone slab market is also excited about the arrival of Trendstone XL, the famous jumbo quartz slabs (3.4 x 1.9). The large size mean that you can have a 3.4 m long island top without any joins. Joins are minimised in general, production time is decreased so costs are saved for everyone involved. Trendstone XL are currently the biggest quartz slabs in Australasia. Whether you’re on the hunt for the perfect stone for your home or business, or just seeking inspiration, you should view the online catalogue. Their current stock is regularly updated online, so you can see for yourself the ever-growing selection of marble, quartzite, granite and travertine. Appointments can be arranged by email or phone to view the gallery. After admiring the showroom, the team will show you through the warehouse to help you find the right look for your project whether you’re renovating your kitchen benchtop, splash-back or office fit out. The space has been cleverly curated in a gallery style so a slab from each bundle is easily viewed at your leisure. Victoria Stone Gallery have opened their doors to share their advice and project knowledge. From architectural design and selection, to post-installation, aftercare and maintenance, Victoria Stone Gallery have you covered. We can’t wait to cross the ditch to check it out for ourselves!